Your pooch may be an adorable angel in every other way, but if proper behavior on-leash is not part of his repertoire, pleasant walks in the park and other outings may be out of the question. 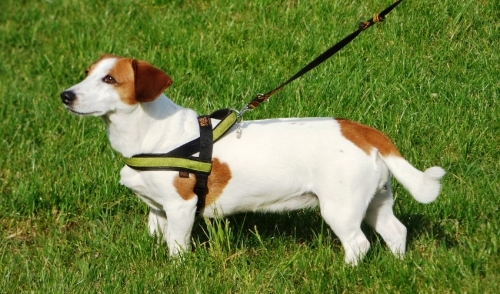 Walking on-leash is an integral part of your dog's training. Dogs are naturally curious animals who get excited by all that the outdoors has to offer, however; heeling at their humans' side on the end of a leash does not come naturally to most. There's no shame in admitting that your canine friend is not a natural where walking on-leash is concerned, but here are several steps you can take to correct this. Setting the same expectations for every on-leash experience. Establishing a handful of places to walk to and only take these familiar routes while your dog is still training. Making each minute on-leash a training session until your dog learns and exhibits the desired behavior consistently. Treats as rewards for good behavior are the oldest trick in the dog-training book. Little bits of kibble or meat are an excellent motivator for dogs; making treats the most common method for patterning. More recently, training experts started using a clicker in place of treats to avoid the dogs' associations of good behavior with food. Whether you prefer plying your pooch with clicks or treats, the end result is the same: by offering one or the other when the dog does what you want him to, he will associate the desired behavior with praise. Use these steps to kickstart your reward-based patterning. Stock up on your dog's favorite treats or buy a standard training clicker (available at pet shops). While walking with your dog on-leash keep the clicks or treats constant. If your dog starts to tug on the leash or becomes rambunctious, stop treating and stand still. Display the correct behavior again by calling him back toward you and rewarding his return. Stick to those steps with every on-leash walk, but gradually increase the interval between rewards. Eventually your dog will heel properly without the enticement of treats. Some dogs need additional help to help them grasp this concept. If you can't inspire your dog to walk calmly on-leash, seeking help from a trainer is your best bet. Though you love your pooch and care for him like no one else could, you may benefit from the help of someone who's life's work revolves around dog behavior and obedience. A leisurely walk with your dog may seem like the stuff of dreams right now, but the above tips can make them a not-too-distant reality. You will be able to go out with your canine companion without the threat of him dislocating your shoulder soon enough. Patience, consistency and expertise will aid you in your effort.